We apologize. This item is currently out of stock. Plasmolifting Centrifuge XC 2415 is intended for the preparation of platelet-rich plasma (PRP) using the Plasmolifting method. Centrifugation of whole blood samples facilitates the separation of blood cells into various distinct fractions; the platelet-enriched area is isolated and used to encourage and accelerate wound healing processes in skin tissue. Plasmolifting Centrifuge XC 2415 is a lab centrifuge used specifically for the preparation of PRP using the Plasmolifting method. You can order Plasmolifting Centrifuge XC 2415 online from MedicaDepot.com or by calling our friendly customer service associates. When you buy wholesale Plasmolifting Centrifuge XC 2415 from Medica Depot, you are acquiring a certified equipment that helps produce good quality and highly purified PRP, for effective and safe PRP treatment. This item is a centrifuge with a fixed-angle rotor that has a 15ml x 12 tube capacity. Also provided is a product insert. This centrifuge is a low speed centrifuge that is used to process whole blood samples to extract platelet-rich plasma and administered to help accelerate the healing of injured or damaged tissues. 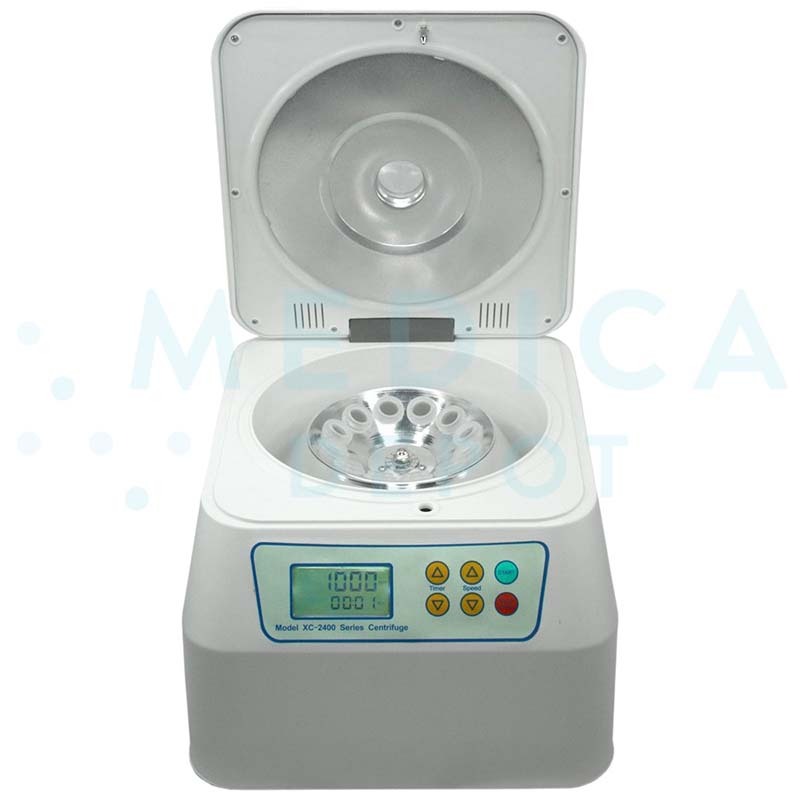 This centrifuge boasts safety and features for convenience, including lid lock while the centrifuge is running, large touch buttons and a large liquid crystal display (LCD). This product is a centrifuge that is used to process whole blood samples to obtain PRP, a blood component that contains a concentrate of platelets, cytokines and growth factors. This blood-derived substance is used to speed up or improve healing and tissue regeneration in damaged or injured tissue. In aesthetic medicine, this therapy is suitable for skin rejuvenation procedures, and is often given to treat the signs of skin aging like wrinkles and lax skin. The centrifuge separates whole blood (collected in special Plasmolifting tubes) into separate components through the application of centrifugal force, enabling the acquisition of a highly concentrated suspension free of other undesired blood components like red blood cells. Timer: 1 – 60 min. 9ml of blood is collected from the patient from a vein into a Plamolifting blood collection tube. The tube is inverted five to six times to ensure complete mix of the blood sample with the tube’s additives. If necessary, a “balance tube” is made by filling a tube with water and solid material (e.g. sugar or salt) until the tube weighs the same as the sample tube. The tubes (sample and balance) are placed in the centrifuge, at direct opposite positions to each other for proper balance. Program the centrifuge to perform the necessary centrifugation step, five minutes at 4000rpm. After centrifugation, the sample should have separated into three portions that are easily visualized: a clot of erythrocytes and leukocytes at the bottom of the tube, the separating gel that forms a solid barrier between the blood layers, and a plasma suspension with the desired platelet-rich fraction. Draw the platelet-rich layer into a syringe with a 30-gauge needle; this preparation can then be injected into the treatment area(s). Depending on the indications, multiple treatment sessions (two to ten intervals of seven to ten days) are typically required to obtain optimal effects. PRP therapy can help treat the signs of aging found on the face, neck, décolletage and the back of the hands and feet. The effects afforded with receiving PRP therapy have been shown to last up to 18 months, depending on the patient’s skin condition and treatment application. PRP therapy can help patients soften the signs of skin aging that occur with time, such as lines and wrinkles, and treat aesthetic imperfections like scars from acne. This therapy can be used in combination with other aesthetic treatments like dermal fillers, absorbable threads, and laser treatments to enhance outcomes and aid in the recovery and healing stages. As the material used in PRP treatment has to be processed in-clinic, it is important that the instruments needed for sample preparation are affordable and specifically designated for this function. The Plasmolifting Centrifuge XC 2415 fulfills these conditions. PRP therapy is generally regarded as very safe as the patient is essentially receiving treatment derived from their own body. As with all injection procedures, however, treatment sometimes results in mild and transient reactions like swelling, bruising, redness and tenderness at the site of injection. These effects, should they occur, are expected to resolve spontaneously within a few days post-treatment.